Kevin DurantMy gift back to God is to always be humble and to always try to work as hard as I can. Kevin Durant is one big, bright star on the world basketball stage today. The 6’9” all-around player owns an Olympic gold medal, was tabbed MVP of the FIBA World Championships, played for an NBA Championship, has notched both multiple NBA All-Star selections and league scoring titles and got crowned collegiate All-American…all before age 25. But in light of all the mushroomed success Durant has had on the court, he knows that there is a component to his life that is so much more fulfilling: his relationship with Jesus Christ. As a kid growing up I was always intrigued by questions like these: How did we get here? Why do we do the things we do? Who made us like this? My mom would sit me down and talk to me, and I had conversations with my school teachers also along the way that helped me out. When I was young, we went to church a lot but we didn’t go as much when I grew up and got into middle school and high school. I should go more than I do even now. It’s hard with the schedule I keep. I do go to chapel before every game. When I first got into the League, (former teammate) Kevin Ollie got everybody going on the team (to chapel) and wanting to learn more. I was just one of the guys trying to follow his lead. He was a good leader in helping me do that, making me feel more comfortable in my faith around other people and being able to pray for other people and pray out loud and things like that. Now I like to lead more and more. My current teammates here (at OKC) do a great job of sticking together and always praying for each other. I read my Bible now all the time. The movie, The Book of Eli, inspired me. The Bible both pumps me up and balances me to play my best, but it also tells me more about the Lord and how I can live for Him and what all He has done for me. I’m not perfect by any means. I have a long way to go to become close to the Lord, but hopefully I can continue to stay on that path. I just want to grow spiritually with the Lord and get to know Him as well as I can. I'm keepin’ strong at it, just tryin’ to make my walk of faith a little better. That's making me a better person, opening my eyes to things, and I'm maturing. Feels good! 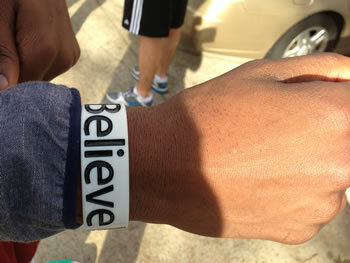 For a while now, I’ve been wearin’ a baller band on my left wrist that says, ibelieve. My spiritual coach (Coach Mo) gave it to me… We talk, and he’s been helping me out a lot in my walk with the Lord. The band is a symbol of my faith statement… I believe God’s love for me, the sacrificial death of Jesus for my sins, and His grace, not my good works, are what saves me. That humbles me and makes me worship Him. I also believe Heaven is reserved for me and that the best is yet to come. I’ve also added a simple tattoo above that same wrist that says, live for eternity. God’s says that’s where we’re all headed. And I wanna start living with that eternal perspective on everything I do now. Many days I kinda pinch myself and say that any day this can all be gone. I know that if I start to get a big head, my mom and others are going to do a great job of bringing me back down to size. I have the best support system with God above and His Word within me as well as a great team of coaches, family, friends and mentors all circling me. I’m in pretty good hands…ibelieve! Would you like to know God personally like Kevin? Click here. Portions of this feature were taken from Sports Spectrum Magazine Spring 2011 and the Inspiring Athletes blog. You can find that blog in full here.